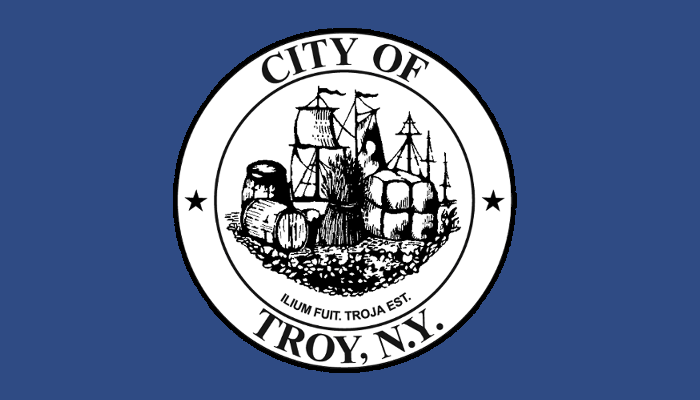 TROY, NY – Mayor Patrick Madden today announced the City of Troy has been designated a Clean Energy Community by the New York State Energy Research and Development Authority (NYSERDA). The designation recognizes the City’s leadership in reducing energy use, cutting costs and driving clean energy locally. To earn the “Clean Energy Community” designation, the City of Troy completed four of ten high-impact clean energy actions identified by NYSERDA as part of the Clean Energy Communities initiative. In addition, the designation has made Troy eligible for $180,000 toward additional clean energy projects, with no local cost share. The City plans to use the available grant funding to install two additional municipal charging stations, upgrade park lighting with energy efficient LED lighting, and purchase five new electric vehicles. The electric vehicles will upgrade the City’s municipal vehicle fleet, replacing older, less efficient cars which require more frequent and costly repairs. Completed energy code enforcement training on best practices in energy code enforcement for code compliance officers and other municipal officers. Installed electric vehicle charging stations and using alternative fuel vehicles, such as plug-in hybrid and battery-electric cars, for municipal business. Streamlined the local approval processes for solar projects through adoption of the New York State Unified Solar Permit. Adopted a community-based Solarize campaign to reduce solar project costs through joint purchasing. Adopting a benchmarking policyto track and report the energy use of the Town’s municipal buildings. Earning Climate Smart Communities Certification through the Department of Environmental Conservation for developing a comprehensive program to reduce its carbon footprint and improve the environment. Establishing an Energize NY Finance Program that enables long-term, affordable Property Assessed Clean Energy financing for energy efficiency and renewable energy projects at commercial buildings and not-for-profits. Performing energy efficiency and renewable energy upgrades to municipal buildings to achieve 10% reduction in greenhouse gas emissions. Originally announced by Governor Cuomo in August of 2016, the $16 million Clean Energy Communities initiative supports local government leaders across the State to implement energy efficiency, renewable energy and sustainable development projects in their communities. Clean Energy Communities like the City of Troy help advance the Governor’s Reforming the Energy (REV) strategy by demonstrating the importance of communities in helping New York reach its Clean Energy Standard of 50 percent of the state’s electricity coming from renewable energy resources by 2030. The “Clean Energy Community” designation is part of the City’s ongoing commitment to implement climate-smart programs and initiatives. In 2018, the City completed the first phase of their solar energy installation project. The 2.1 megawatt system provides 20 percent of the city’s annual electric needs while saving an estimated $2M in municipal energy costs over the next decade.